This is what’s on our Christmas List, we hope you get everything on your Christmas List too! 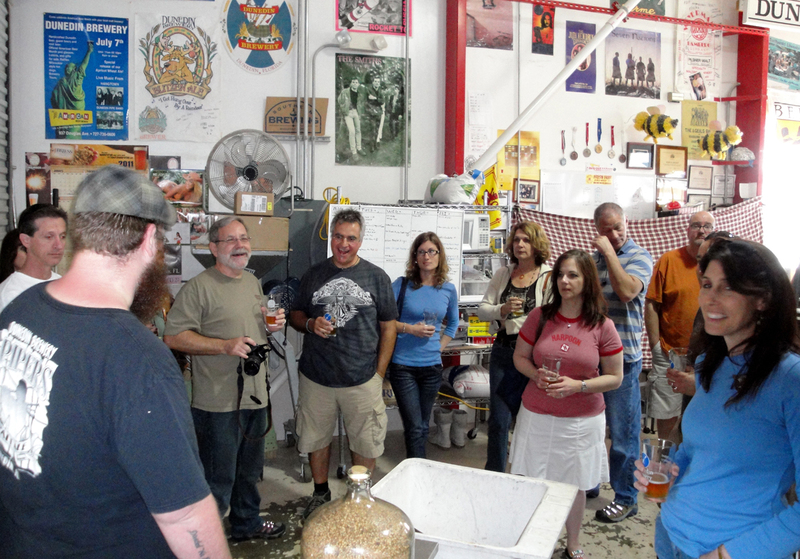 Our 2nd Annual Tampa Bay Beer Safari Weekend Beer Tour was quite a success! 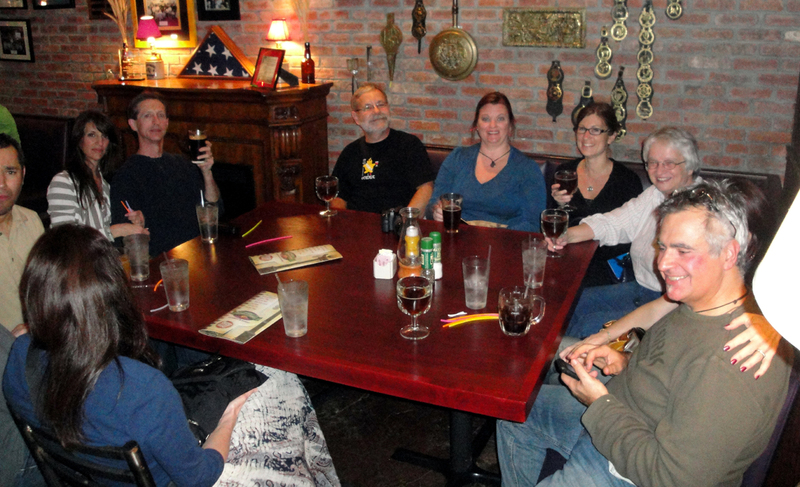 We visited 2 brew pubs, 2 breweries, had two great beer paired dinners and 2 after dinner beer tastings. 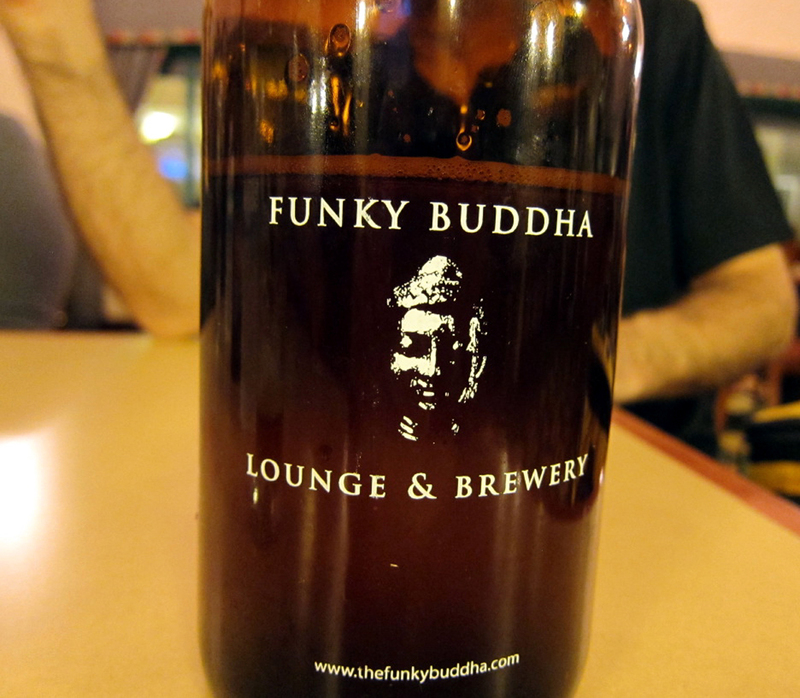 …Plus 2 extra special growlers fresh from the Funky Buddha Lounge & Brewery in Boca Raton! Funky Buddha’s “So Thank You Music”, oh what a great nose you have! So Thank You Music was the “Hit” of the Happy Hour with its amazing nose of fresh ginger and lemongrass, as well as its wonderful taste which matched the nose. A close second was Last Snow, which is an interesting name as Boca Raton never even gets a 1st snow… actually it’s a celebration ale for those in South Florida to toast with as the “Last Snow(bird)” leaves the region. After the happy hour we took a short walk to Bernini, a fabulous Italian Restaurant in the heart of Ybor City for our first beer paired dinner. 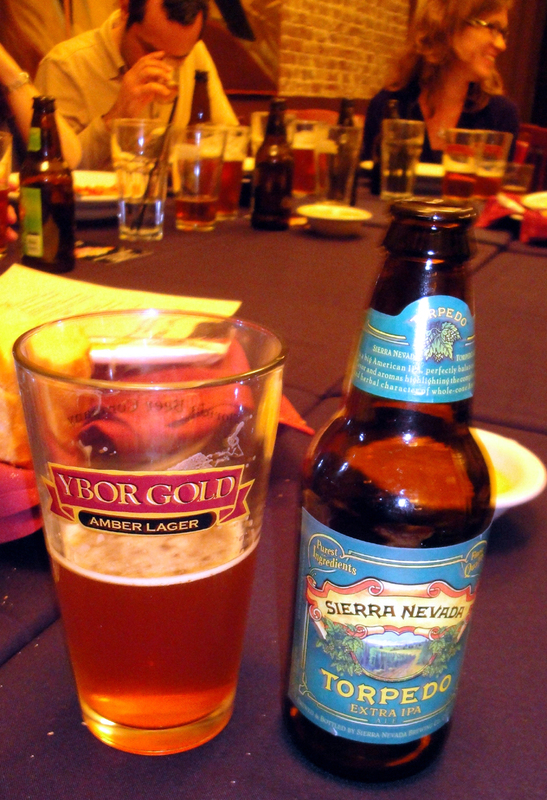 To honor Sierra Nevada Brewing Co’s 30 years of great brewing I paired 3 of their outstanding brews with this evening’s dinner. 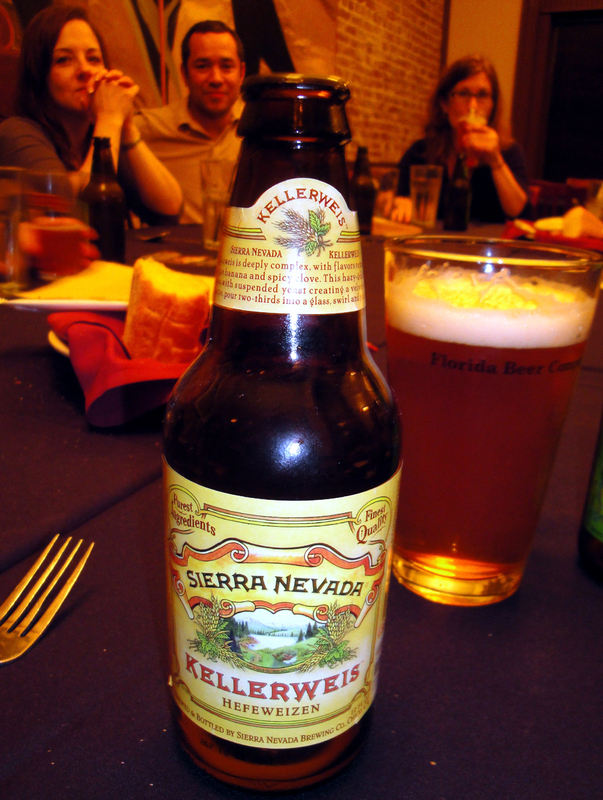 Kellerweis – Hefeweizen – 4.80% abv. In my opinion this is one of the better examples of a true German Hefeweizen made in America. Pale Ale – American Pale Ale – 5.6% abv. 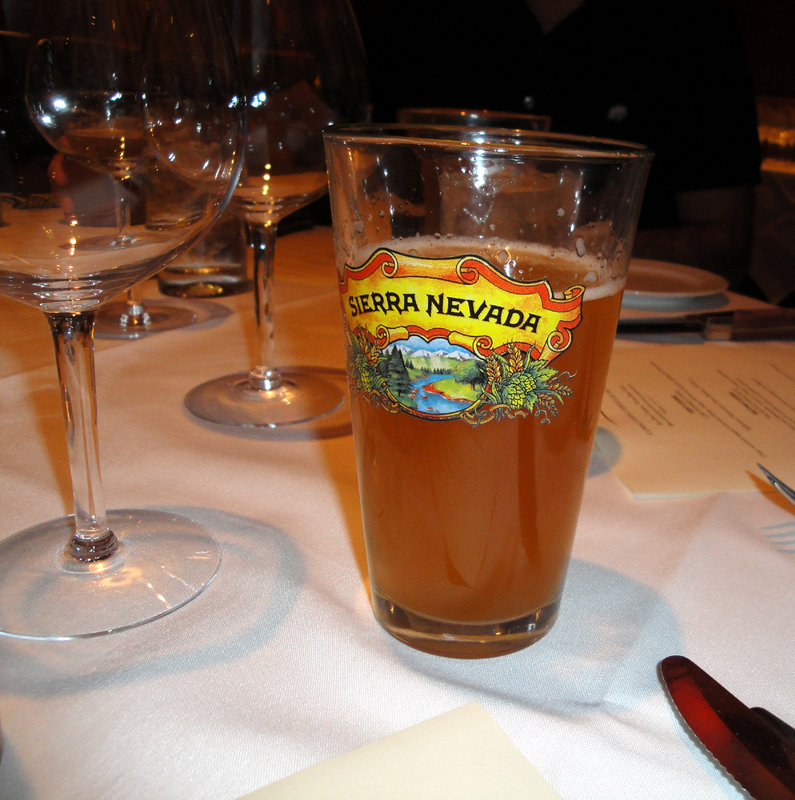 This is Sierra Nevada’s “Flagship” beer and the one beer you can count on finding in most pubs or restaurants which haven’t figured out the craft beer movement yet. 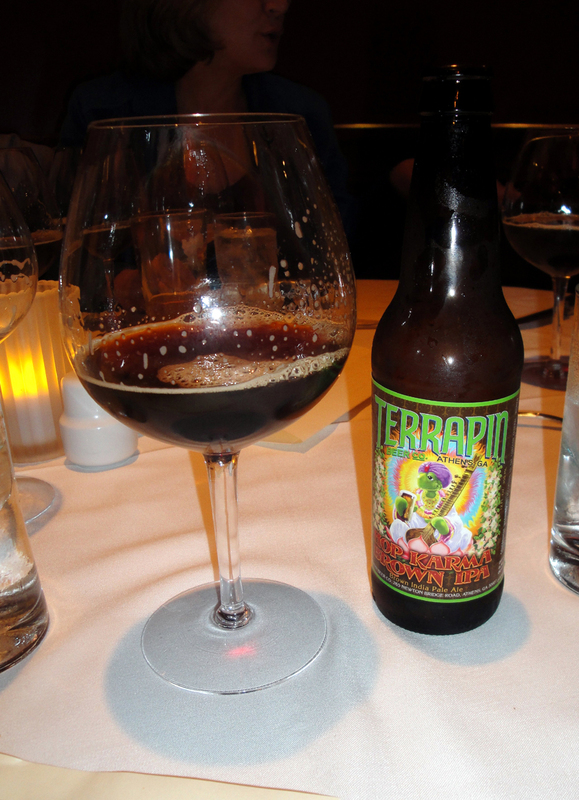 Torpedo Extra IPA – IPA – 7.2% abv. This is their Pale Ale on steroids! 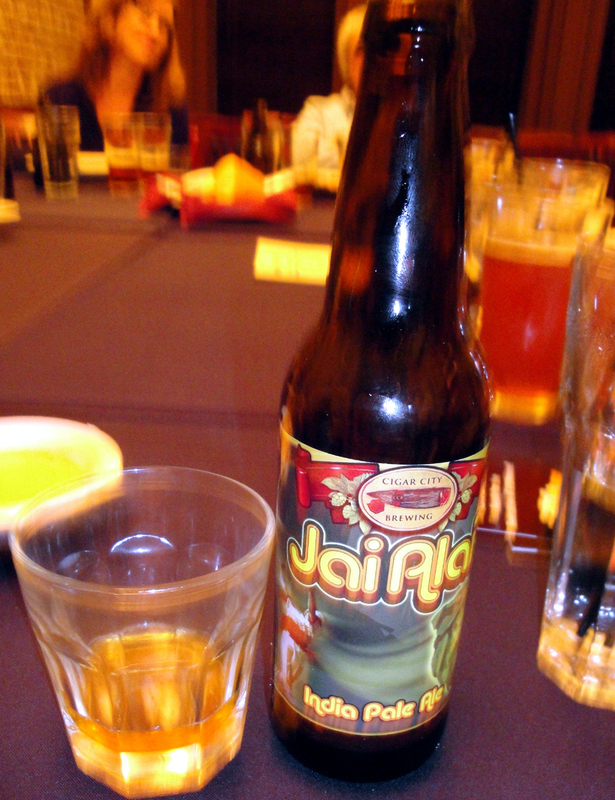 We also had the opportunity to try the Torpedo Extra IPA side by side with Cigar City Brewing’s Jai Alai IPA – IPA – 7.5% abv. Maybe I’m being a “homeboy” but I felt the Jai Alai had a tad better nose and taste, I have to say, it was it really close. 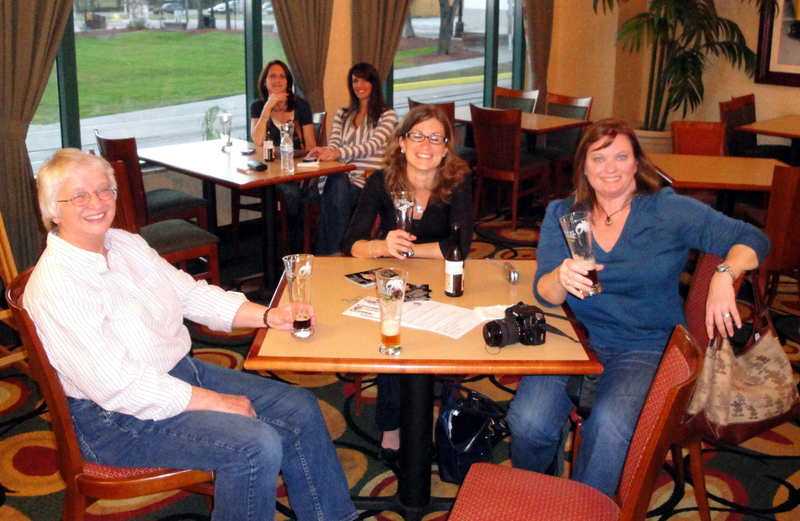 After the dinner & the “show” we walked around the corner to see what was brewing at the Tampa Bay Brewing Company. 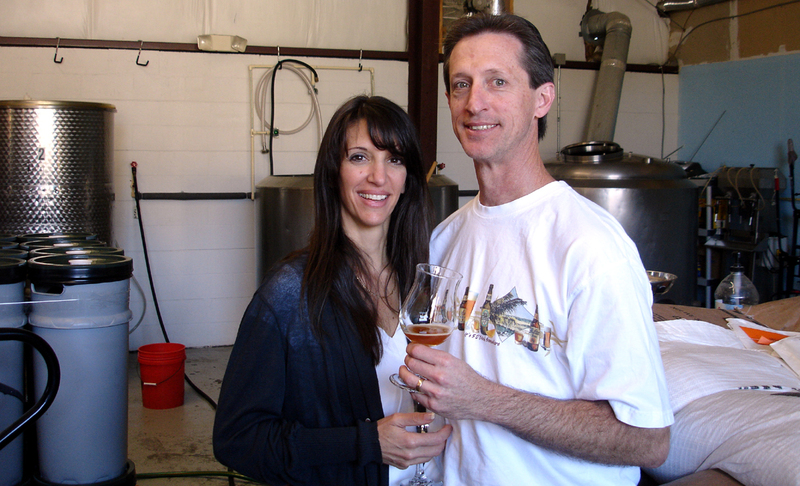 Tampa Bay Brewing Company was founded in 1996 and is a family business, with mother and son serving as general manager and brewmaster respectively. Their on-site brewery is equipped to produce up to twelve tap beers and several cask-conditioned ales on a 10bbl step-infusion brewing system. As a matter of fact, 12 of their 16 serving tanks used to hold the beer at the famous Bass Ale Brewery in England. Here we tried the Wild Warthog Weizen – 5.2% abv; Jack the Quaffer London Porter – 5.7%; Iron Rat Stout – 8.0% abv and the MooseKiller Barleywine- 10.0% abv as well as a taste of their fabulous Root Beer, which is made on site. 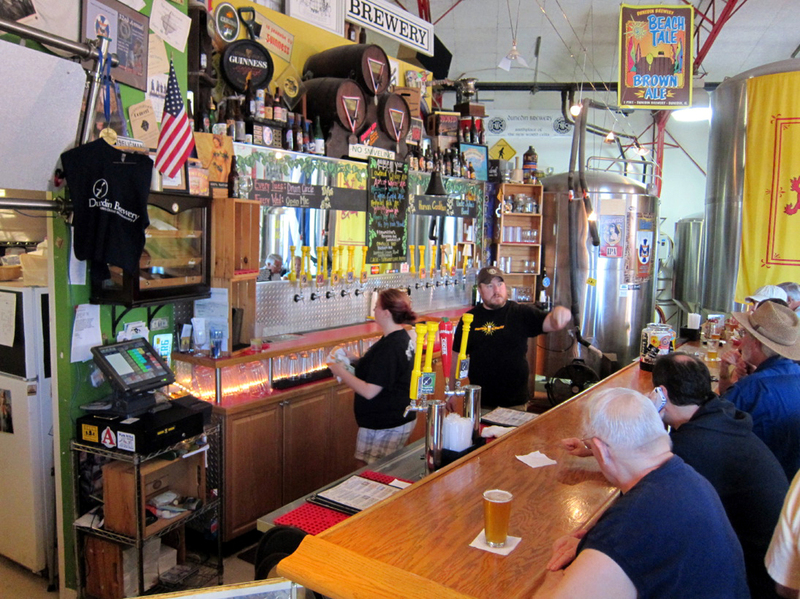 After we left Tampa Bay Brewing Co, our plan was to do some beer hunting at New World Brewing Co. At New World Brewing you will find the best selection of craft beer in Ybor City with 26 taps and at least 100 bottled beers. You can also enjoy entertainment in their outside courtyard. 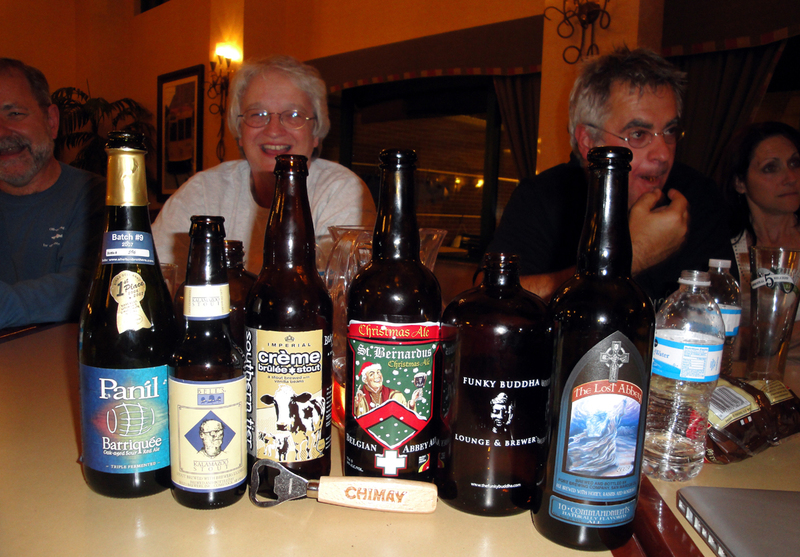 However tonight the courtyard was packed, so instead we opted to return to the hotel and do some beer tasting in a more relaxed atmosphere. On Saturday morning our 1st stop was Tarpon Springs. Tarpon Springs is known as the Sponge Capital of the World, so we visited the Famous Spongeorama to see the Sponge Diving Museum and stroll along the waterfront and a few specialty shops. 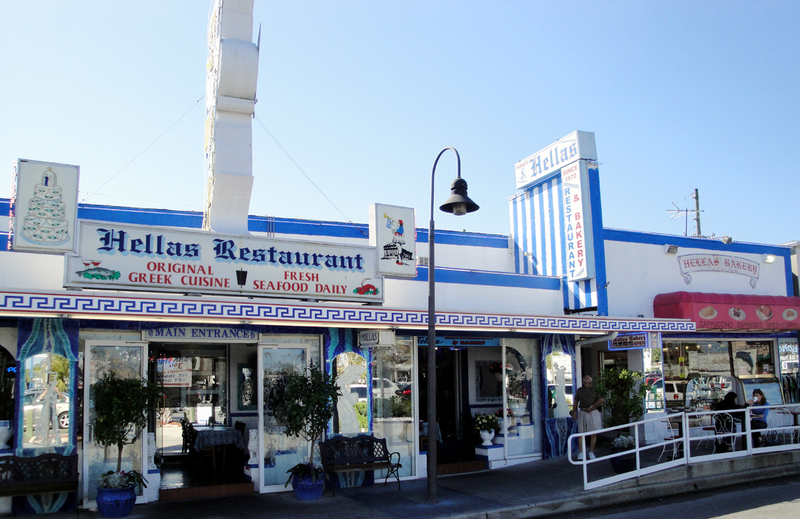 Tarpon Springs is also Florida’s own Greek village, so we of course had to sample some mouthwatering pastries at the very authentic Greek restaurant, Hellas. This was a “sweet” way to start the morning! After spending about an hour here, we headed off to meet our friend Bob Sylvester and see his brewing set up at Saint Somewhere Brewing Company. While Bob explained to us his brewing process, including his use of open fermentation, he also showed off his new tanks and told us that he has just expanded to offering his 3 brews- Saison Athene – Saison – 7.5% abv, Lectio Divina – Belgium Strong Pale Ale – 8.0% abv & Pays du Soleil – Dubbel – 8.0% abv- in kegs. After seeing the size of this small brewery everyone was extremely impressed when Bob told us that his beers can be found in 35 states! It is truly mind boggling that that much beer can be produced here. Bob also said that he will be brewing the next collaboration beer he has planned with Cigar City called Déjà Vu, in this location. 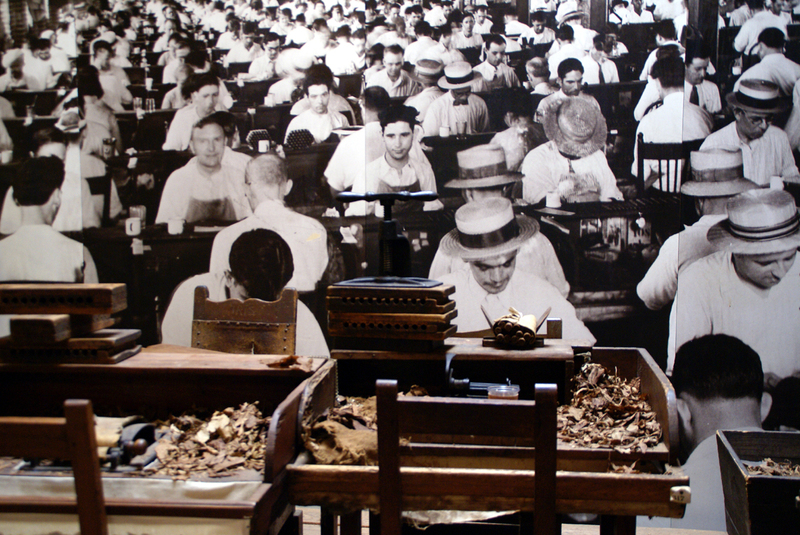 He told us that it will be a completely different style then Vuja Dé, which was made at Cigar City. 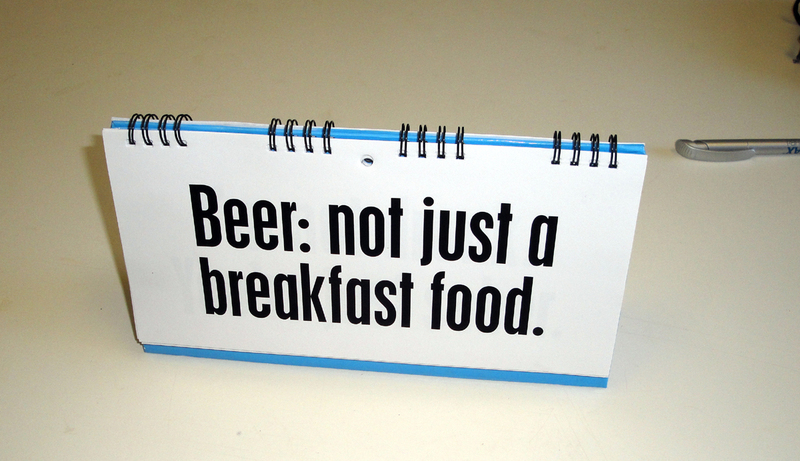 Did you know that 11:00 am is the time of day your taste buds are supposed to be most in tune? 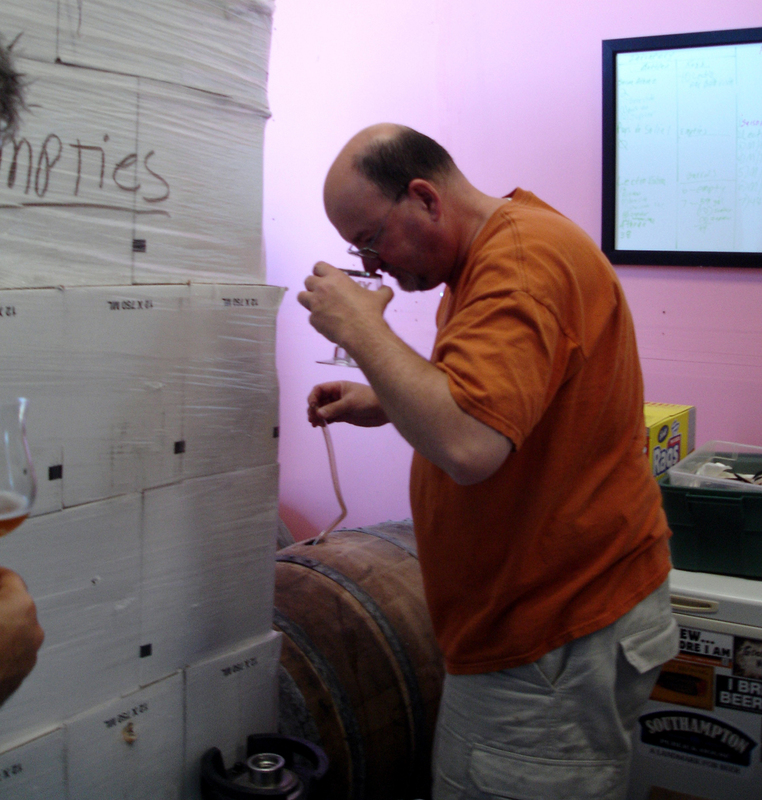 Well fortunate for us our beer tour happened to be at Saint Somewhere right about then, and we were invited to help ourselves to a taste of Lectio Divina out of the keg…and as if that wasn’t a beautiful thing in itself, Bob also shared with us 3 additional very special brews! The 1st special brew was an extremely young oak barrel aged blend of his beers. 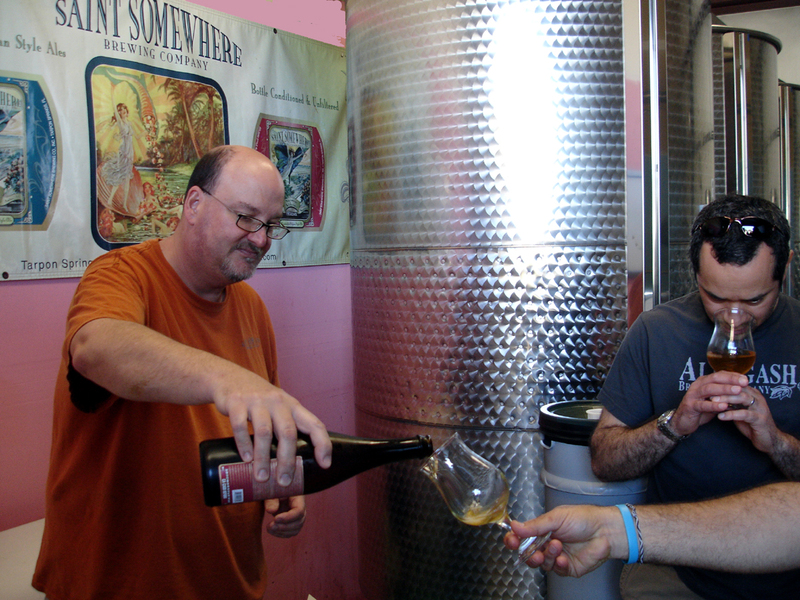 Bob warned us that it was “young & hot” and really needed to age quite a bit longer before consuming. The nose of this beer was a mixture between rocket fuel and nail polish remover, however when it came to the taste, it was like drinking a fine port wine with no hint of the fuel or remover. His 2nd special brew was a mature 2-3 year old oak barrel aged blend. This beer was sublime, the nose was mildly tart/sour with hints of oak, caramel and vanilla and the taste was both tart yet mildly sweet of fruit- with notes of the oak and a smooth as silk mouth feel. I could drink this all day. Ruth says just thinking about it makes her mouth water! The 3rd special brew was a taste of a beer which he says never made it to the market. It was his Saison Athene with Brettanomyces “C” strain. The “C” strain added more tartness and citrus in the nose and taste than you would find in the “regular” Saison Athene. After tasting these 3 beers, it made me feel extremely blessed that we have such a great Belgium style artisanal brewer here in Florida. So we left Tarpon Springs to head over to Florida’s Scottish heritage town, Dunedin. 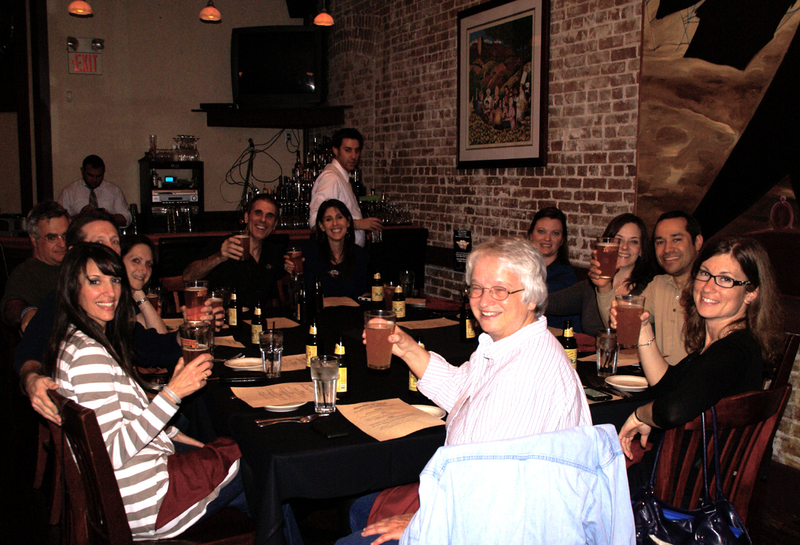 Here we visited Dunedin Brewery for a brewery tour, beer tasting and a great lunch! Plus we will have Bob from Saint Somewhere join us too! 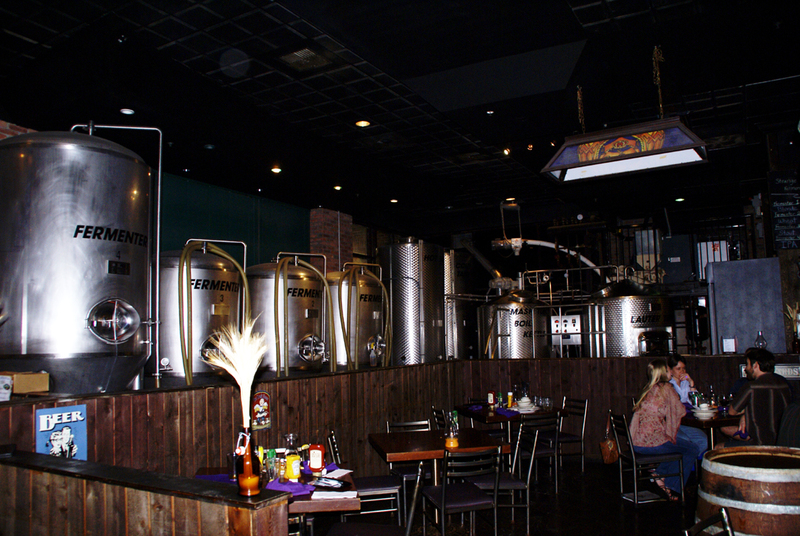 Dunedin Brewery is the oldest microbrewery in Florida. 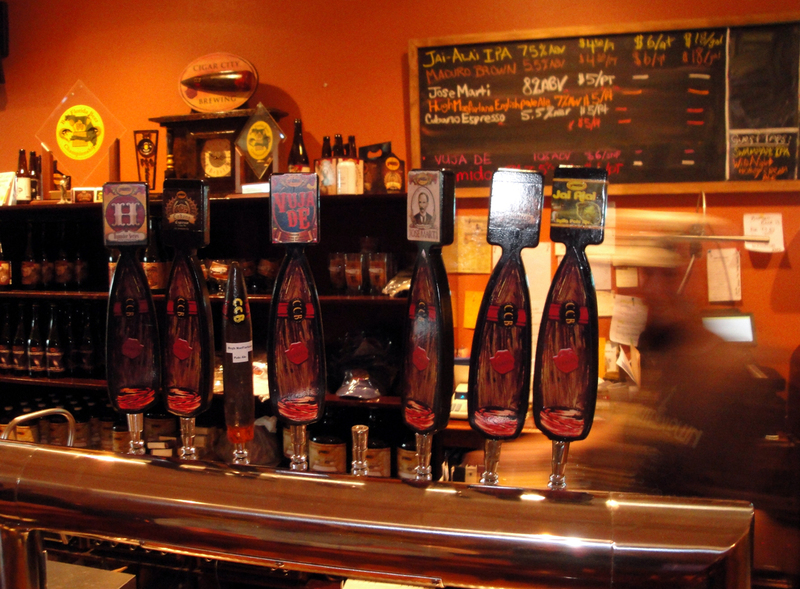 They always have 8 of their beers available year round on tap plus a few extra seasonal beers as well as guest taps. Leonard Croon Stout – Stout – 5.2% abv offered to us by Ricky (our awesome guide, beer tender and server) before we placed our order for lunch. I chose to have their famous Pacific Coast Fish Taco, and since I heard they still had some of their delicious Christmas Farm Ale – Spiced Beer – 5.2% abv available, I paired that with my fish taco. Boy, this was one great lunch stop! 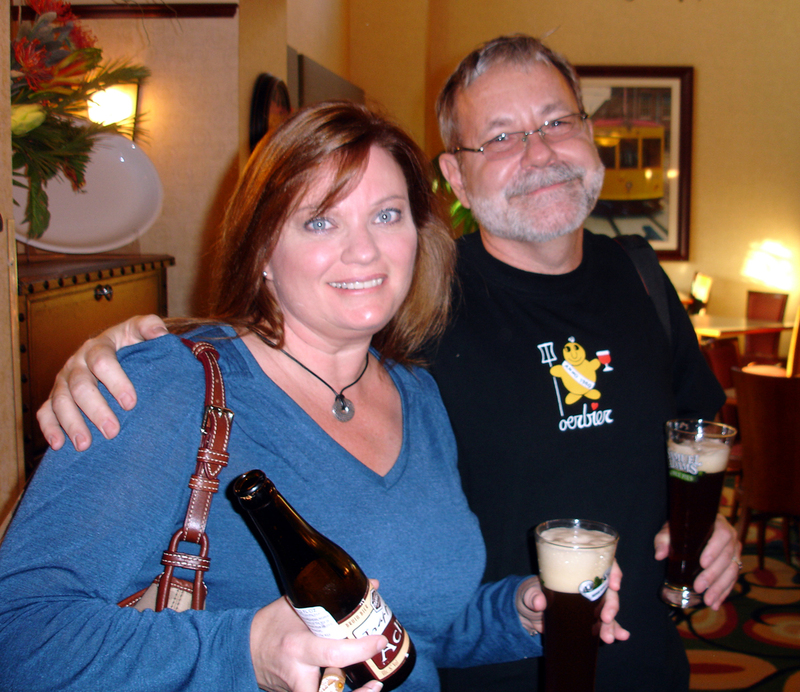 Having fortified ourselves, we will set off to Cigar City Brewery. On our way over to Cigar City we passed the time playing a few rounds of Beer Cap Bingo for some beery cool (of course) prizes. 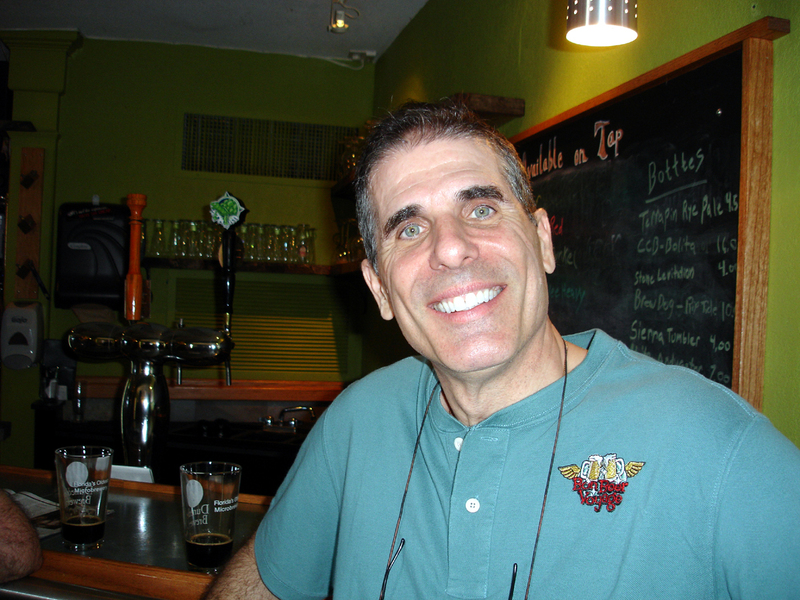 Cigar City Brewery was founded by beer columnist and Tampa native Joey Redner in the summer of 2007. 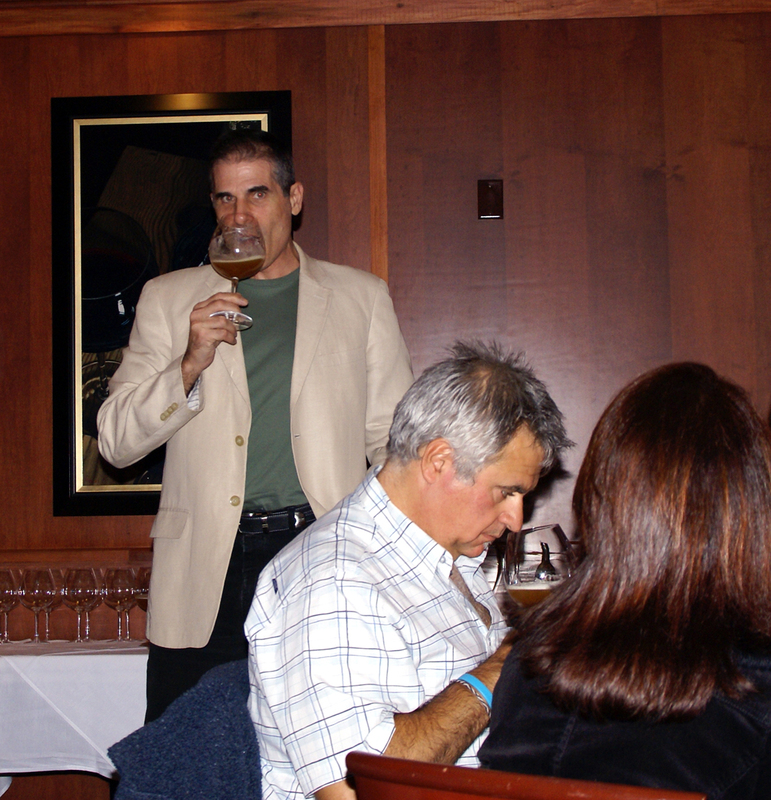 Since its inception CCB has been guided by Joey’s passion for both great beer and the city of his birth. 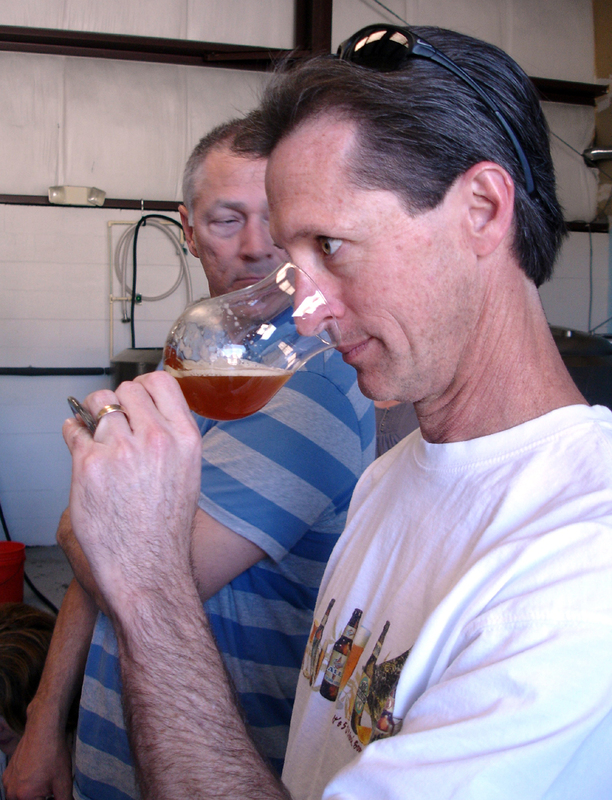 With the creative input and expertise of Great American Beer Festival and World Beer Cup award winning brewer Wayne Wambles, Cigar City Brewing endeavors to make world class ales and lagers which celebrate the rich heritage and traditions that make Tampa one of the world’s most unique cities. During our tour of Cigar City’s facilities what struck me the most was how much they have expanded since we were here last year. 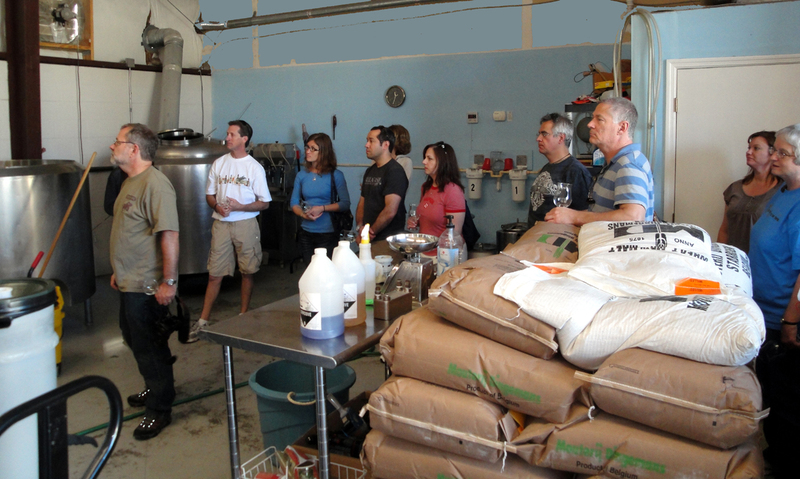 During our walk around the brewery we even caught a glimpse of a group of B.J.C.P. judges occupying the back end of the brewery where they were hard at work judging something I’m sure we will quaff in the future! 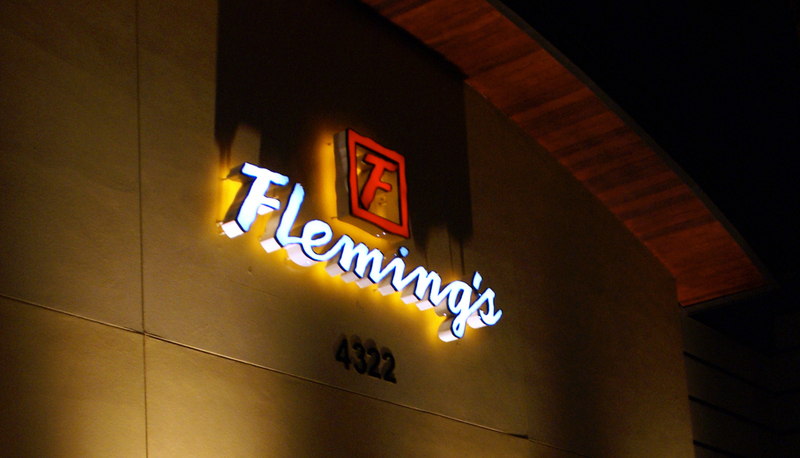 Stylish, contemporary dining is the hallmark of Fleming’s. The menu features the finest in prime beef, augmented by a tempting variety of chops, seafood, chicken, generous salads, inventive side orders and indulgent desserts. 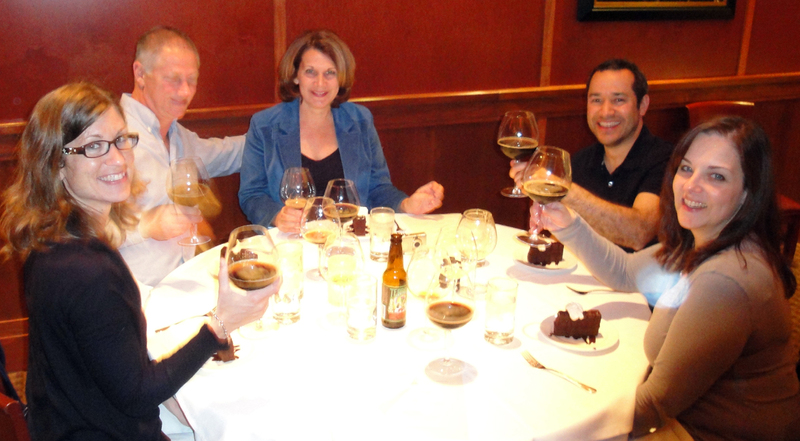 We had a 4 course beer paired gourmet dinner created especially for our Beer Safari by the chef at Fleming’s. Sierra Nevada Kellerweis a Hefeweizen of 4.80% ABV by Sierra Nevada Brewing Co.
Young’s Double Chocolate Stout a Sweet Stout 5.20% ABV Wells & Young’s Ltd. Between Courses we had a brief overview of the beer we were drinking and the chef explained how he paired the meal with the beer. 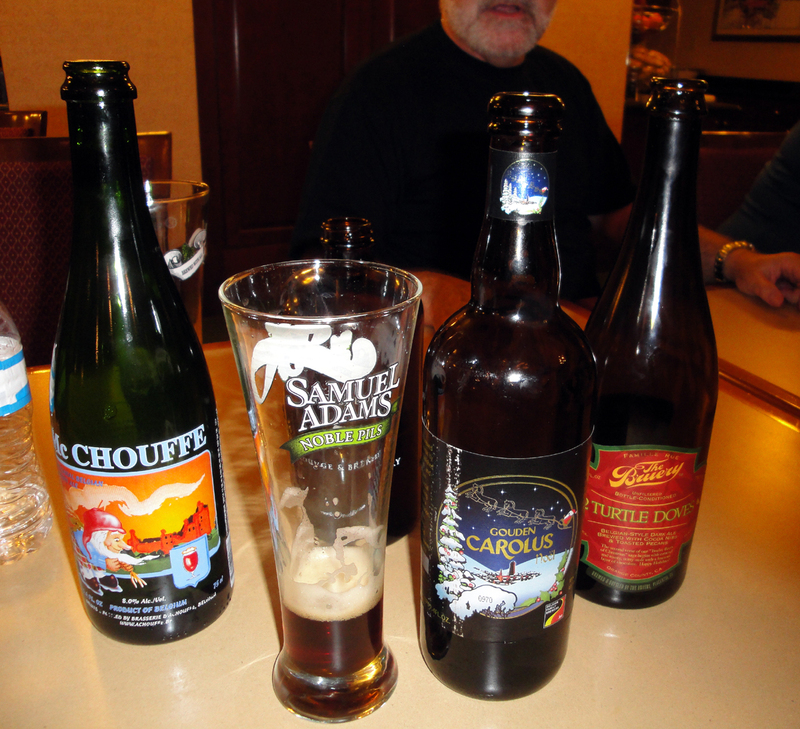 As you can see, we decided to try the same beer for the first pairing as the previous night, in order to do a comparison of appetizer/beer pairing for this beer, just to try something a little different. This Kellerweis is what I consider the perfect example of this style. After Dinner we returned to the hotel for another round of beer tasting, but the 1st order of business was to settle our dispute as to which cartoon dog, Muttley or Snuffles, was the one which would jump up and then float down in air on his back like a feather after receiving a treat. To our surprise it was both! On Sunday morning after a leisurely breakfast we enjoyed a perfect day for our guided historical walking tour of Ybor City (the original “Cigar City”). Our guide informed us that Ybor City is also the home of the 1st brewery in Florida, the Florida Brewing Company (after prohibition it was re-named Tampa Florida Brewery, Inc). In 1896 the construction of the Florida Brewing Company started; when it was finished, it was the tallest building in Tampa at six stories. They used the water from a natural spring which ran under the building to make their La Tropical Beer. 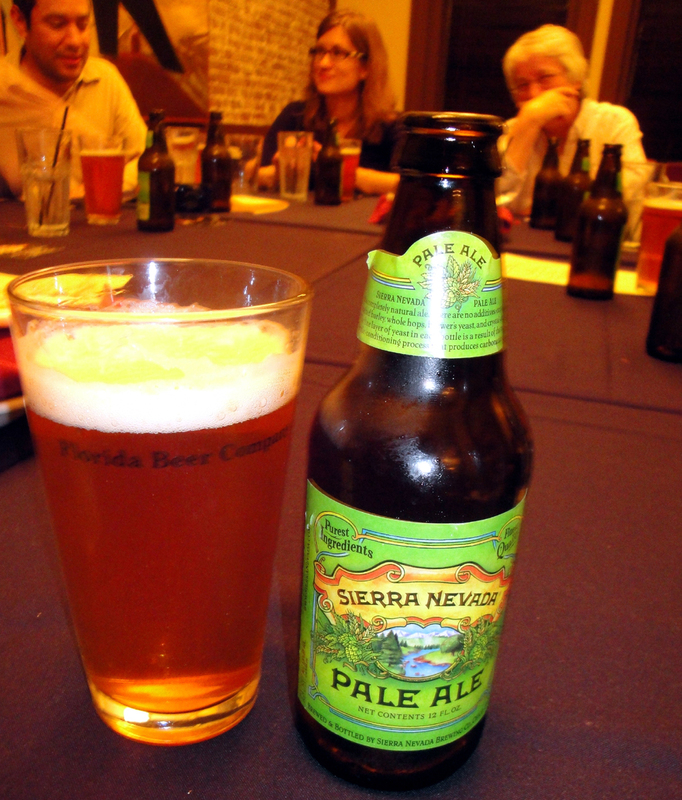 The Florida Brewing Company exported more beer to Cuba than any other brewery in the USA. Unfortunately this Brewery closed in 1961. Then was back to the hotel to say our goodbyes and check out. Overall, an amazing weekend with a fantastic group of people and great beer to match! 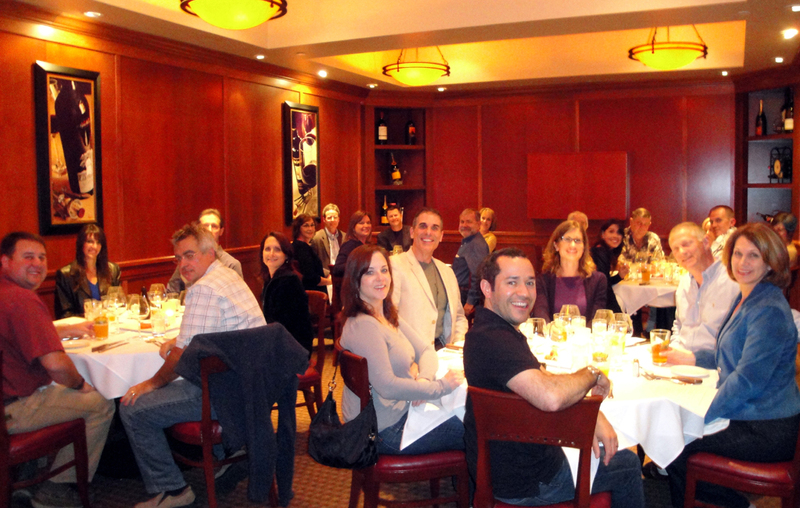 Can’t wait until our next one! 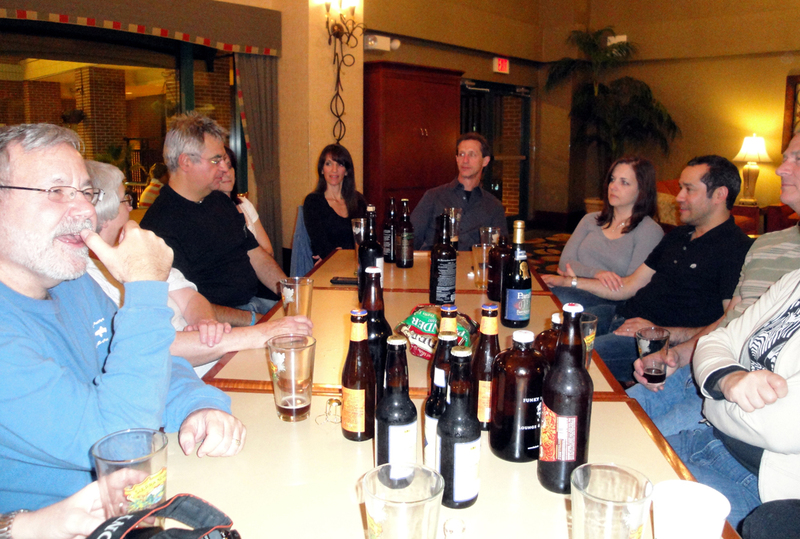 Looks like the Saint Augustine Beer Safari Weekend will be coming up in September…make sure you are on the BEERmail list to keep up to date on the latest with our Beercation Beer Tours and Weekend Beer Safari beer trips! Cheers! How served: 750 ml capped bottle poured into The Bruery tulip. My Overall Opinion: Very Good. I paired this beer with: Rotisserie lemon pepper chicken. This was a very good pairing. Note: This beer poured an opaque golden color with a very large 3 finger fluffy white head leaving a thick lacing on the glass. The nose was mildly funky with hints of grapefruit. The taste starts off dry and only mild funkiness was tasted. The middle of the taste was of spices and grapefruit rid and then ended very dry. The mouthfeel was light to medium bodied with a high level of carbonation. The drinkability was very good and like the label states, is ideal for drinking in warmer weather. 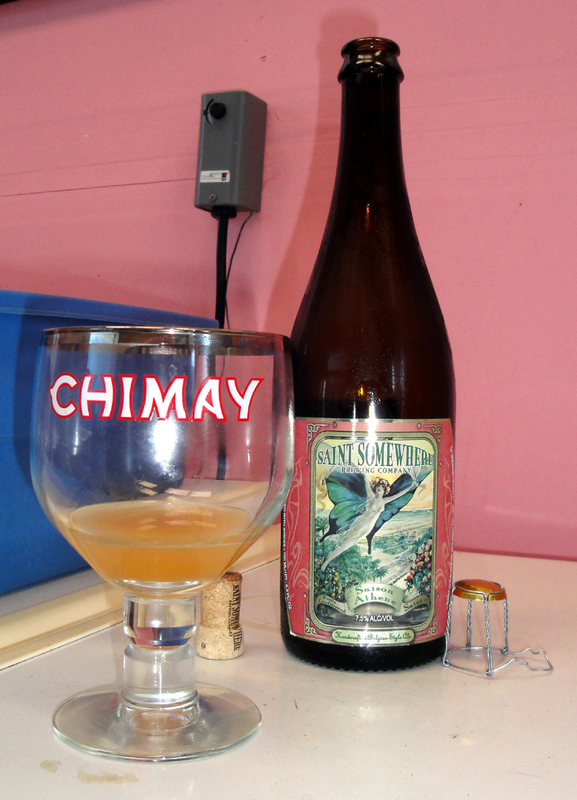 Overall this is a very pleasant saison and I enjoyed it as it warmed and got a bit more funky. 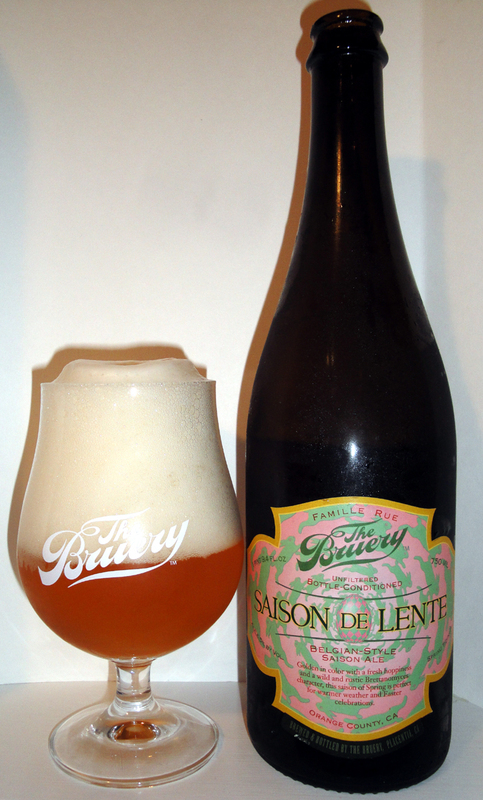 Even though I have had many other saison I like better than this one, I’ll still buy it again. Worthy of a try. On the Label: Belgian-Style Saison Ale. Golden in color with a fresh hoppiness and a wild and rustic Brettanomyces character, this saison of Spring is perfect for warmer weather and Easter celebrations. Our Spring Saison will evolve over time; clean and hoppy when fresh, and drier with earthy, wild notes when aged up to two years. 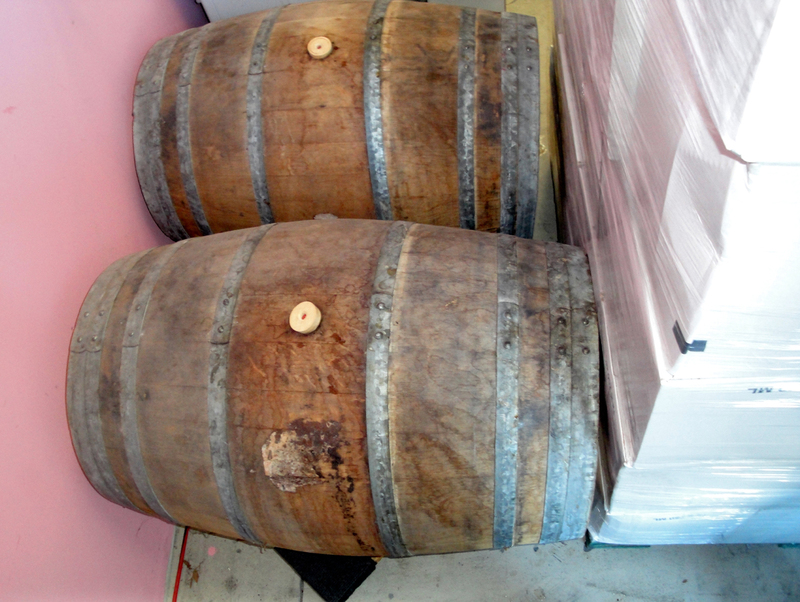 Best stored and cellared around 55° F (13° C) in a dark place. Ideal serving temperature is 50° F (10° C). Please pour carefully, leaving the yeast sediment behind in the bottle. Best served in a tulip or wine glass. From their website: Our Spring Saison is light blonde in color with a fresh hoppiness and a wild and rustic Brettanomyces character. Lighter in color and alcohol than our Saison Rue, yet equally complex in its own way. Perfect for warmer weather and Spring celebrations. How served: 750ml capped bottle poured into a Duvel glass. I paired this beer with: homemade vegetarian lasagna made by a possible brother in law 2 be. Great Paring!!! Belgium Strong Pale Ales is one of the few beers which pairs very well with Italian food with a tomato based sauce, IMHO. 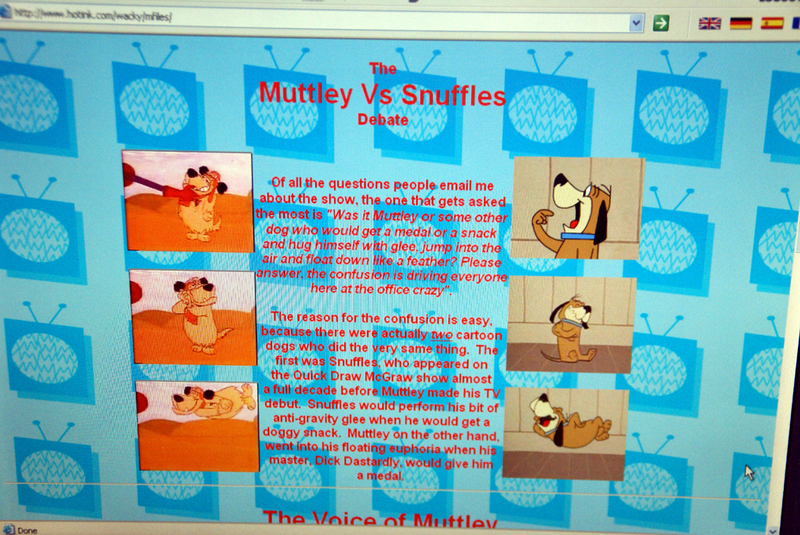 Tasted on: Monday March 8th, 2010. Note: Simply a fantastic example of a Belgium Strong Pale Ale with a Hop kick. This is a very drinkable beer with a bit of mischief as the name says. It is not a Duvel clone, but a Duvel clone with a hop kick to it. So if you are looking for a little more hop action in your favorite Belgium strong pale ale, this is your answer!!! I’m sure glad I have more of this beer to enjoy over the next few weeks. 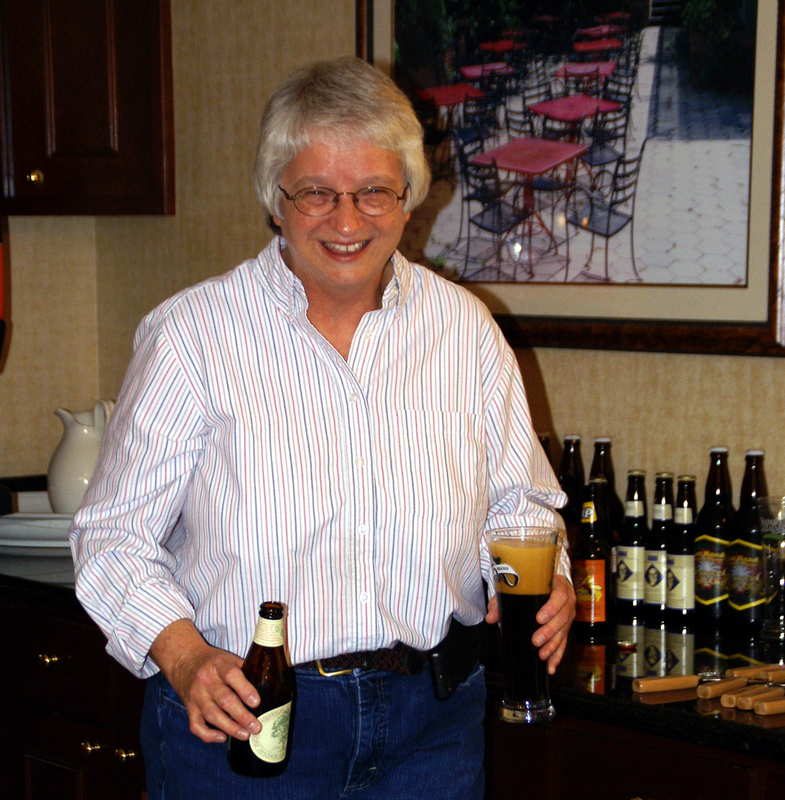 Request to the Bruery… Please make more!!!!! On the Label: Unfiltered Bottle Conditioned. Belgium Style Ale. Golden & Hoppy. Not quite evil, yet not to be trusted, this Golden Ale is effervescent, dry, hoppy and crisp-you’ll want to keep an eye out. Mischief is best enjoyed fresh. Until then, please store in a cool, dark place. Ideal serving temperature is 45 F (7 C). Please pour carefully, leaving the yeast sediment behind in the bottle. Best enjoyed in a tulip or wine glass. 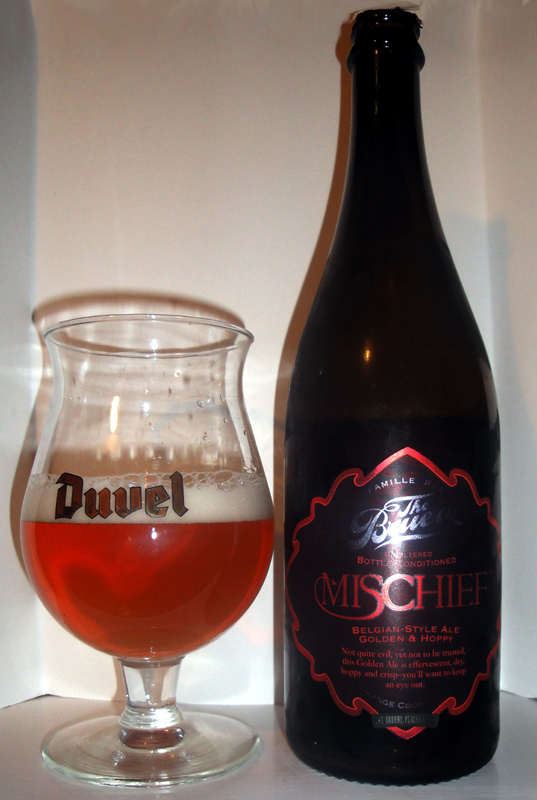 From their website: Mischief is a Hoppy Belgian-Style Golden Strong Ale. This wickedly good golden ale is fiendishly dry-hopped with American hops to add a layer of complexity and mystery to its fruity, dry Belgian-style character. Citrus and resin diabolically combine with ripe melon, pear and slight peppery spice in a precariously effervescent mixture. Enjoy it, but you’ll want to keep an eye out. How served: 750ml capped bottle poured into a Augustijn Grand Cru glass. I paired this beer with: Steamed Tilapia marinated in lemon and butter, yellow squash & green beans. 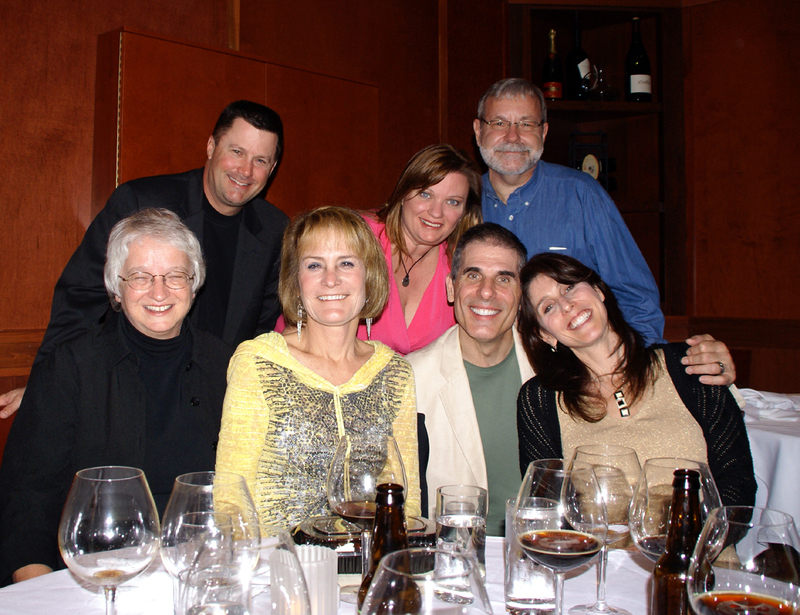 Tasted on: Wednesday February 3, 2010. Note: The Bruery has just become available in the S. Florida area for the 1st time last week. This is great news as I have had to have their beers shipped in from out of state, including their highly rated Black Tuesday. Now this witbier is very refreshing and would be great to drink during a hot Florida summer day, but I feel it lacks the complexity of other Belgian & Belgian style witbiers I have had in the past. 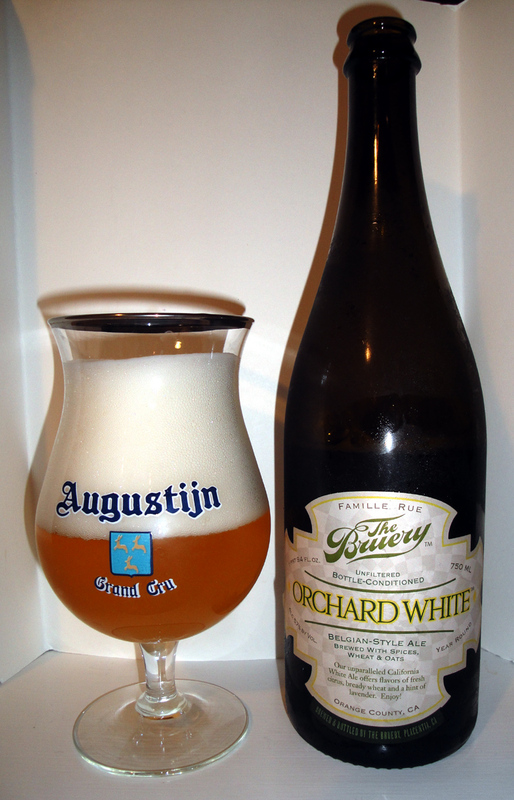 Orchard White should still be on you “wants” list, as it is worth a try. I will re-visit this beer on a hot summer night & who knows, that just might be enough for me to raise my rating to a very good. On the Label: Unfiltered Bottle-Conditioned. Belgian-Style Ale. Brewed with Spices, Wheat & Oats. Our unparalleled California White Ale offers flavors of fresh citrus, bready wheat and a hint of lavender. Enjoy! Our White Ale is best enjoyed fresh. Until then, please store in a cool, dark place. Ideal serving temperature is 45° f (7° c) in a dark place. Best served in a tulip or wine glass. For chef recommended food pairing and recipes, please visit our website. From their website: Orchard White is an unfiltered, bottle conditioned Belgian-style witbier. This hazy, straw yellow beer is spiced with coriander, citrus peel and lavender added to the boil and whirlpool. A spicy, fruity yeast strain is used to add complexity, and rolled oats are added for a silky texture. How served: 750ml capped bottle poured into a Delirium Tremens glass. I paired this beer with: a good Stilton cheese. 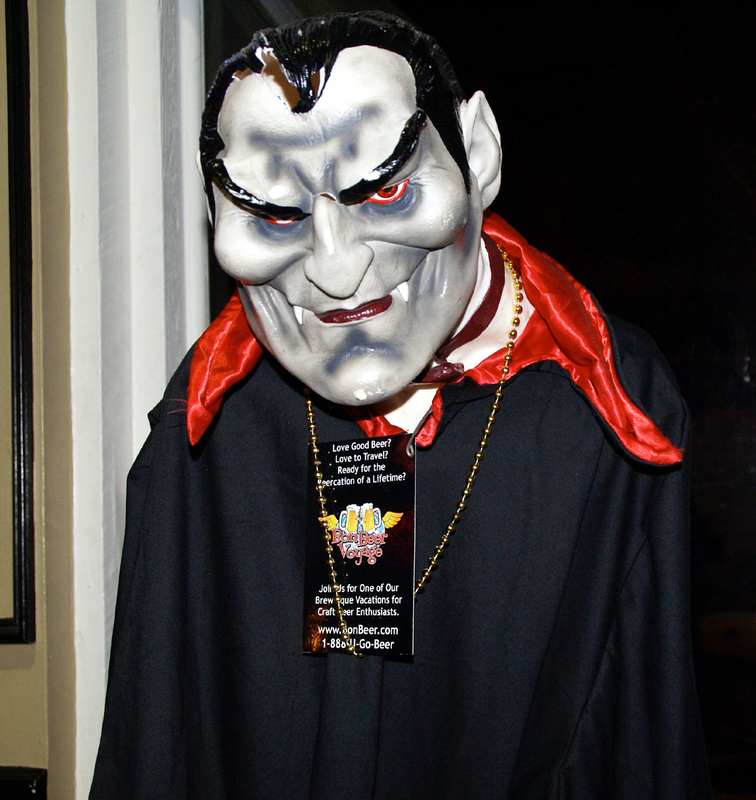 Tasted on: Wednesday January 27, 2010. Note: This is a beer worth trying, but don’t be upset if you can’t find it. It was very drinkable and I gave it a high rating, as it is very good for its style, but it is not an Oh My G-d beer. This is a beer to be enjoyed & will not overwhelm or underwhelm you. On the Label: Unfiltered Bottle-Conditioned. Julebryg-Style Dark Rye Ale. 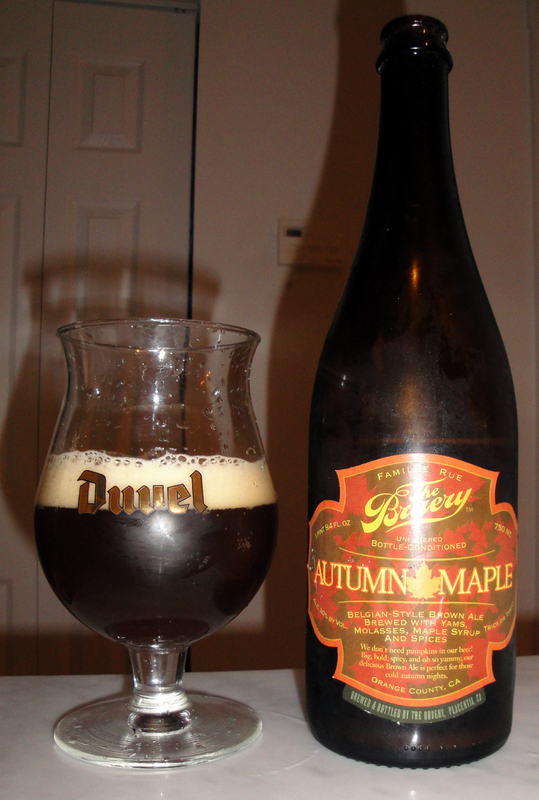 A deep autumn colored robust Danish-style ale with spicy rye, and caramelly, bready malts. 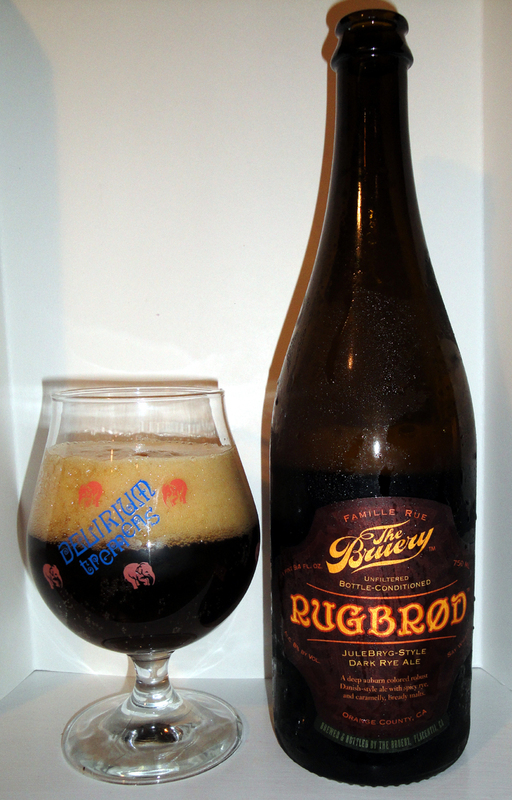 Rugbrød Rye ale is suitable for aging up to two years when cellared properly, around 55° f (13° c) in a dark place. Best served at 50° f (10° c). Pour carefully, leaving the yeast sediment behind in the bottle. Best served in a tulip or wine glass. For proper pronunciation, chef recommended food pairing and recipes, please visit our website. From their website: Meaning “rye bread” in Danish, we took our inspiration for this beer from the Danes’ staple dark, whole-grain rye bread. Brewed with three types of rye malt, this robust brown ale showcases the earthy, spicy character of the grain, complemented by bready, nutty barley malts and a hint of roast. Loosely based on the Scandinavian Christmas beer or “Julebryg” tradition, this beer is perfect for the colder weather of winter, although it will be available year-round (because who doesn’t love a dark beer now and again, regardless of weather?) And don’t worry about the name, we can’t pronounce it either! But we do have a video of us and a lot of others trying our best at http://www.vimeo.com/7504797. How served: 750 ml capped bottle poured into a Duvel Tulip. I paired this beer with: the classic American Thanksgiving meal with all the works. Note: This beer wasn’t overpowering spicy, but might have been a bit too sweet.